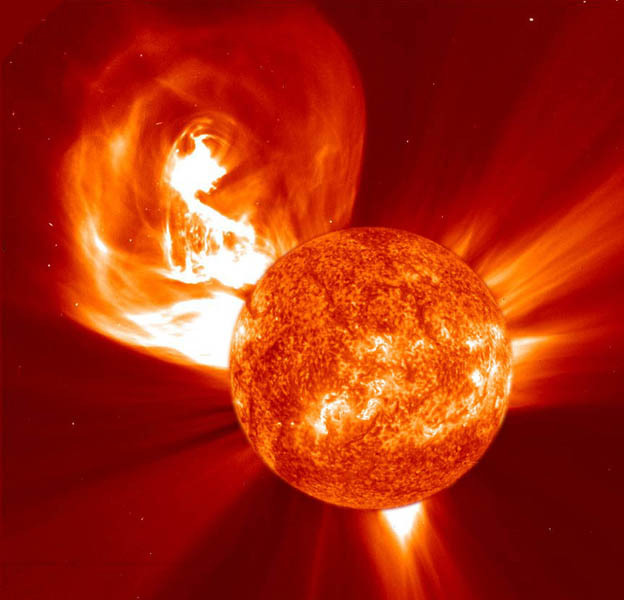 Links Through Space: Sun Storms and Solar Flares, The Sun is exploding CRAZY! Sun Storms and Solar Flares, The Sun is exploding CRAZY! The Sun has ejected the strongest solar radiation storm since September, 2005. NOAA says the storm is currently in progress and continues to get stronger, with a very fast CME (Coronal Mass Ejection) headed towards Earth. When the ejection is directed towards the Earth and reaches it as an interplanetary CME (ICME), the shock wave of the Coronal Mass Ejection causes a geomagnetic storm that may disrupt the Earth's magnetosphere. This process can cause particularly strong aurorae in large regions around Earth's magnetic poles. These are also known as the Northern Lights (aurora borealis) in the northern hemisphere, and the Southern Lights (aurora australis) in the southern hemisphere. We are expecting a massive Sun Storm heading our way. This will bring us great opportunity to see the Northern Lights (Southern Lights). We wish it will not disrupt our communications, transmissions or other electrical devices. HERE is an Infographic from Karl Tate at Space.com that explains the phenomena. LEDs are categorized in different types like miniature, mid range and high power according to their different sizes present in the market. These LEDs are considered to be the best source of light emission as these have a low wear and tear as compared to the other light emitting sources present in the market. LEDs when developed by Holonyak were developed to provide a simple and inexpensive way for computers to convey the information and then it was used in the portable calculators but now these LEDs are used from the coffee making machines to the 290 ft tall Reuters billboard in Times Square. Today these LEDs provide us an unmatched high quality and experience of TV watching by the LED televisions that are available in the market.